This artwork was part of a fundraising auction Ochre: Supporting Indigenous Health through Art held in 2008. 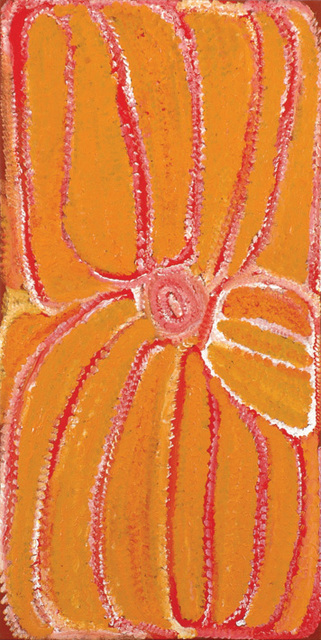 Eubena has painted some of her country south-west of Balgo in the Great Sandy Desert. This country is located along the Canning Stock Route near Kunawarritji (Well 33). The circles depict tjurrnu (soakwaters) and the majority of the painting depicts the tali (sandhills) that dominate this country.